I'd like to enter my Spinbox Widget into the competition. 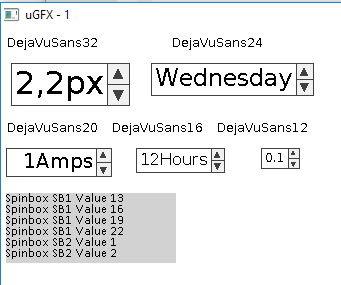 The screenshot shows it running in a Win32 console with a selection of fonts to show the automatic sizing of the widget to the font. The spinbox.h file contains additional notes, features and usage etc. Spinbox.zip contains the Spinbox source and Win32 console demo files. I have also included a short video of the Spinbox demo in action.